Village Signs is a series of caches based on the ornate signs that depict the heritage, history and culture of the villages that put them up*. This cache is a simple traditional cache, parking is also available near gz. 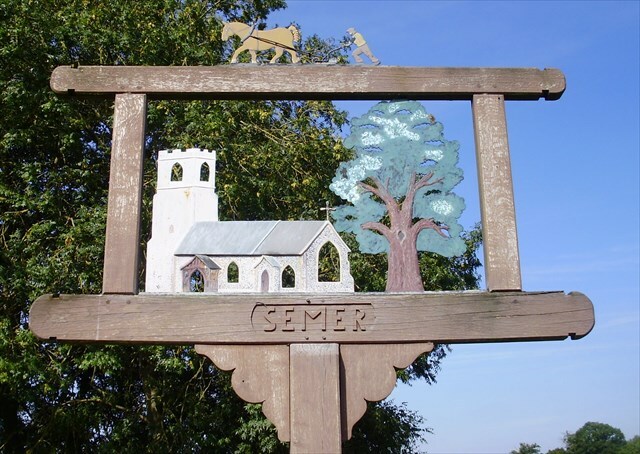 People, on visiting Semer, often ask, “Where is the centre of the village”? There isn’t one, at least not in the sense of nearby Kersey or Bildeston. The site of the village sign is as good as any, with manor, church, rectory site and river crossing all nearby. There is no record of a pub in the village, although only up to a few years ago families were brewing their own beer, usually sharing the facilities and equipment. Semer today follows much the same pattern as those of 800AD, others became nucleated whereas ours didn’t. In 1385 eleven men in Semer were found to be selling beer in illegal measures and cups. They were amerced (fined) 3d each in the manorial court.